Are you looking buy a board game for a 4 year old boy or girl? In this comprehensive review guide, we have selected 9 great kids games that we guarantee they will have fun playing with. Board games are a lovely way to play together as a family or with friends, while also helping young children to develop important skills such as counting and matching. At age 4, children are often able to engage with simple games and card games that involve turn-taking, competitive play and trying to reach a common goal, so this is a great age to introduce them. Fun games are an excellent activity for helping children to calm down and focus and are also an ideal way to pass a rainy afternoon. 1.9 9. Stacking Block Game Where’s Bear? 2.0.1 Do Girls and Boys Like Playing with The Same Board Games? 2.0.2 What are the Benefits of Playing With Board Games? 2.0.3 Is it possible to Buy Board game Replacement Pieces? 2.0.4 Can toddlers age 3 play with board games designed for 4 year old boys and girls? Board games for children don’t need to be particularly expensive to be good fun and of high educational value. It is worth paying for quality playing pieces, since children’s games are likely to suffer more wear than similar games for adults (many a parent has found playing tiles stuffed down the back of a chair). Games with moving parts or sound effects are likely to cost a little more, but even very simple games can provide lots of family fun. Young children are usually only able to focus on an activity for a short period of time, particularly when they are employing emerging skills. Games of ten to twenty minutes are therefore ideal for 4 year olds. The games featured here are all an appropriate duration for this age range, but bear in mind that the stated game duration is only a guide: some children will want to take things more slowly and interruptions are also very likely! Most of these games work well with multiple ’rounds’, so if children are keen to continue playing at the end of the game then they can easily do so. All these games state the age range that they have been designed for, but do not be too rigidly bound by this. 4 year olds are not all the same: some will confidently recognize basic words while others will continue to rely on pictures for some time. Some of these games include specific variations for younger children but most can be simplified if necessary. When choosing a game, bear in mind whether it needs to be suitable for a range of ages and abilities, for example in group settings or in families where siblings may want to join in too. These 9 games include a mixture of variations on classic games – such as Go Fish and bingo – and more novel games that encourage children to develop different skills such as strategy and basic addition. Some are strictly card games, but all provide a good combination of entertainment and education. This variation on the classic Go Fish game involves color matching fish-shaped cards. It is an excellent choice for children who are learning to count. The colors used in the 44-card deck are bold and the interesting color names are sure to be a talking point! eeBoo have recruited top children’s book illustrators to design the artwork. Though strictly a card game rather than a board game, Go Fish is a great way to help children practice turn-taking and the lovely cards make it a pleasure to play. This delightful game from Orchard Toys helps children learn to add up to 10. Described as a ‘first addition game’, it involves adding up two numbers and moving the corresponding number of lily pads. The winner is the player that gets to the party first! The game pieces are well made and the playing boards are attractively illustrated. A clever feature of this game is that lily pad counters are provided to help to make addition more tangible for younger children. The double spinner adds an extra element of fun to the proceedings! Shopping List is Orchard Toy’s bestselling game, and for good reason. It involves multiple elements that help children to learn: memory skills, observation, matching skills and reading. Crucially, it relates to real life, which makes it really easy for young children to relate to the game. Players choose a shopping list and turn over cards to find the groceries – such as eggs, tomatoes or toothpaste – they need to buy. The lovely pictures mean that no literacy skills are required, but older children may begin to recognize the product names too. Booster packs are available to extend the game. 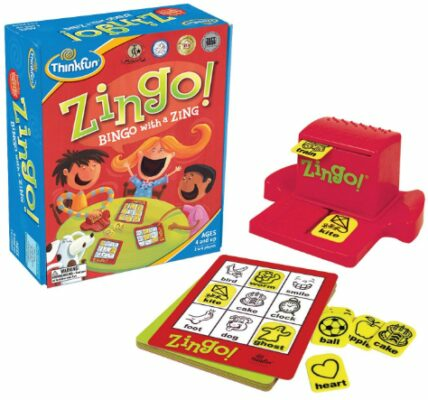 Zingo is an award winning game that adds an extra ‘zing’ to the basic bingo concept. The instructions are clear and straightforward, so gameplay can begin almost immediately. The game is simple enough that children may be able to play together, without adult support. Designed for pre-readers and early readers, the cards combine simple pictures with clear text, helping children to begin to recognize words. The winner is the player that completes their board first. The unique Zinger device is certainly the highlight of this fast-paced game! This version is designed for up to 7 players. 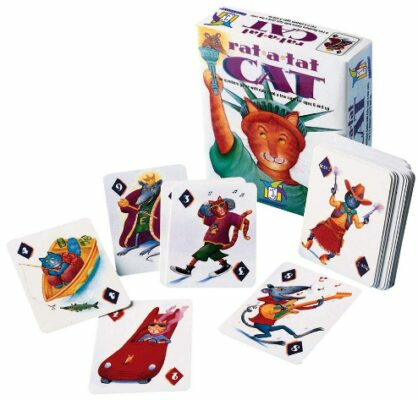 Rat-A-Tat-Cat is a fun board game, by Gamewright, that’s an involved game that helps children begin to develop more advanced skills such as memory, strategy and an understanding of probability. It’s, therefore, no surprise that it has won a Mensa award! Players try to collect low-scoring cool cat cards and discard high-scoring bad rat cards. The player with the lowest score wins. As they play Rat-A-Tat-Cat, children intuitively employ mathematical concepts and strategic thinking. More advanced players may begin to notice and learn from other players’ behavior and instinctively adopt a poker face. Colorama by Ravensburger is an excellent introduction to gameplay for preschoolers and is a good game for four year olds. It involves color and shape recognition and helps to encourage hand-eye coordination. Unlike some other games aimed at this age range, this game doesn’t require any reading skills. Children are introduced to basic gameplay concepts and skills such as turn-taking, dice-rolling and piece-moving. Together with the colorful play pieces, this makes the game very tactile, which helps children to maintain concentration. Colorama offers 4 variations to suit a variety of abilities, with each lasting approximately twenty minutes. It is therefore well-suited to families and groups with multiple children of varying age and skill level. At over six feet long, this gigantic game contains a huge amount for children to discover. The game brings Richard Scarry’s Busytown world to life, with a bustling harbor, busy streets and a working farm. The tagline for this game is ‘Eye Found It’ and children gain confidence every time they correctly identify the object they are searching for and announce, “I found it!”. The ‘Goldburg Mysteries’ help children develop teamwork skills by bringing players together to play cooperatively to solve a mystery. Unlike most board games, Busytown promotes active play as children move around the board searching for objects and to see what other players have spotted. The illustrations are rich, engaging and at times a bit silly, providing plenty of fun and things to talk about. They also encourage patience, perseverance and attention to detail: children need to look very carefully! Feed the Woozle may be a little bit silly, but it is a seriously good game that has won multiple awards. Like Peaceable Kingdom’s other preschool ‘skill-builder’ games, it emphasizes cooperative working and helps children to develop basic skills including counting, color matching and motor skills. Players work together to feed funny snacks to the Woozle. The three play levels mean it can be adjusted to the age and ability of the group. The cooperative nature of Feed the Woozle creates a non-stressful atmosphere and fosters important soft skills such as shared decision making. 9. Stacking Block Game Where’s Bear? 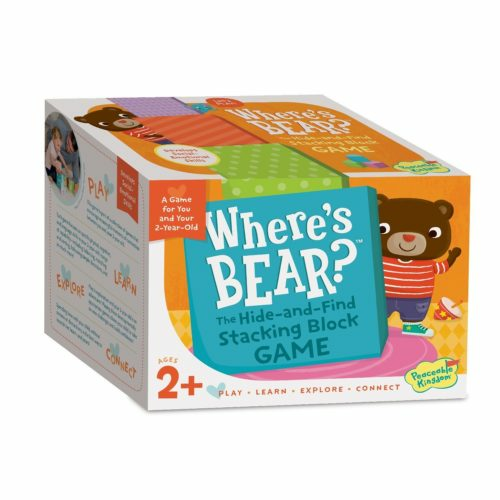 Where’s Bear is a lovely game that’s aimed at children from 2 years old. First and foremost, it’s a delightful activity to help parents and carers to connect with their little one, since it combines a fun stacking activity with a hide-and-find game. It offers a gentle introduction to gameplay, presenting concepts such as taking turns and following rules. The blocks are attractively illustrated with familiar scenes and objects that children can enjoy naming. The game facilitates discussion of concepts such as up, down, top and bottom. There’s no winning or losing; just lots of fun and an easy way to play and learn. Do Girls and Boys Like Playing with The Same Board Games? Board games have traditionally not been quite as gendered as some other toys, such as role-play toys or fancy dress clothes. The 9 games featured here should all appeal to both boys and girls and are not particularly gendered. However, different children will enjoy different types of game: some will prefer cooperation to competition, some will prefer real-life scenarios to fantasy and some will prefer fast-paced games to those that require patience and planning. However, these differences are unlikely to run along gender lines. When choosing a game, consider the child’s interests and skills, rather than being influenced by their gender. What are the Benefits of Playing With Board Games? Educational board games help children to develop a broad range of transferable mental, social and emotional skills such as literacy, numeracy, memory, strategy, waiting and empathy. These games allow everyone to participate: turn-taking means that quieter children are not excluded. Playing board and card games encourage children to calm down and focus on an activity. Playing games together builds relationships: it facilitates parent/child bonding and helps children to develop friendships. Board and card games are fun, exciting and often hilarious! Is it possible to Buy Board game Replacement Pieces? It’s almost inevitable, when playing board games with young children, that a playing piece will eventually go missing or break. This doesn’t mean you need to get rid of the game – it’s usually fairly straightforward to carry on without that piece. However, many of the game designers mentioned here provide a replacement piece service. Usually a quick email is all that’s required. Peaceable Kingdom and Thinkfun are examples of companies that will replace pieces – though there may be restrictions on the number of pieces or the geographical areas they serve. If you can’t get hold of a replacement piece, why not try fashioning a replacement yourself? Can toddlers age 3 play with board games designed for 4 year old boys and girls? There’s nothing to stop toddlers from having a go at games designed for 4 year olds. They may well be able to participate in color identification and picture matching. However, children do a lot of growing up at this age in terms of ability to focus, attention span, patience and coping with competition. 3 year olds are therefore likely to require more adult support with games than 4 year olds, and a group of 3 year olds are much less likely to be able to regulate their own play without adult supervision than a group of older children. 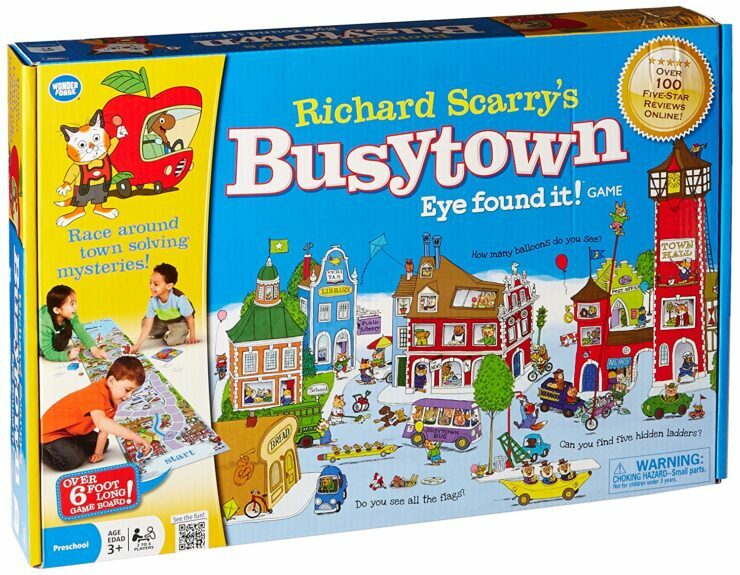 For a fun board game that also helps children to learn, it’s hard to beat Busytown by Richard Scarry. The teamwork element is lovely and there’s so much to see, discuss and laugh about. This is one of the top games for 4 year olds, its a great way to help children develop important life skills including patience and perseverance. For buying on a budget, Orchard Toy’s Frog Party Game is a great choice. It’s got a bit of everything: a mathematical skill-building basis, an element of competition, variations for younger players and a fun double spinner. It’s a fun family game that also works well in group settings.